All lights comply with the requirements of “Convention on the International Regulations for Preventing Collisions at Sea, 1972” of IMCO (Inter-government Maritie Consultative Organization). Available with a polycarbonate lens and polycarbonate case or a glass lens and a metal case. Both types meet the regulations for A-2 Class vessels. 1. IMO Regulation MSC.253(83) Adoption of the Performance Standards for Navigation Lights, Navigation Light Controllers and Associated Equipment. 2. IEC 60945:2002 Maritime Navigation and Radio Communication Equipment and Systems-General Requirements-Methods of Testing and Required Test Result. 3. IMO Resolution A.694(17) General Requirements for Shipborne Radio Equipment Forming of the Global Maritime Distress and Safety System(GMDSS) and for Electronic Navigational Aids. 4. Annex I of Convention on the International Regulations for Preventing Collisions at Sea(COLREG) 1972 and Its Amendments. b). 10, 101 mean Suitable for ship length 50m or above and Double lights, 1,11 mean Suitable for ship length 50m or above and Single light. g). 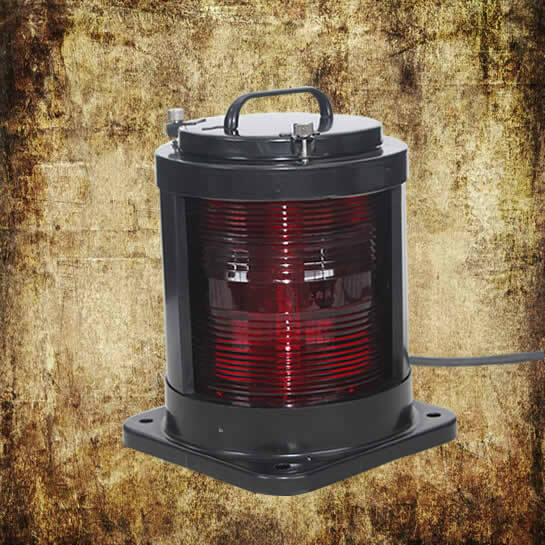 All round or anchor light without shield plate.